SMS provides affordable communication way to keep worldwide clients informed about your business news, share market information, new launch product details etc. So, to attract visitors and clients towards your business, use Mac bulk SMS Software which provides reliable delivery of order recipients, price notifications, text alerts on multiple mobile phone at same time. Mac bulk SMS Software for multi USB modem creates own messaging gateway to send global text messages without internet connection. PC to mobile group text messaging program successfully delivers bulk SMS from your Macintosh OS X installed computer using USB modem. Group SMS software facilitates to send instant text alerts on multiple contact number and automatically skips duplicate number entries. Software facilitates to load contact number from phonebook and send bulk sms without entering contact number manually. » Mac SMS program sends text alerts from PC via connecting multiple USB modem. » Text messaging software facilitates to deliver standard SMS and notifications. » Empowers users to promote your brands and increase business productivity. » SMS software facilitates to save sent text messages as templates for future reference. 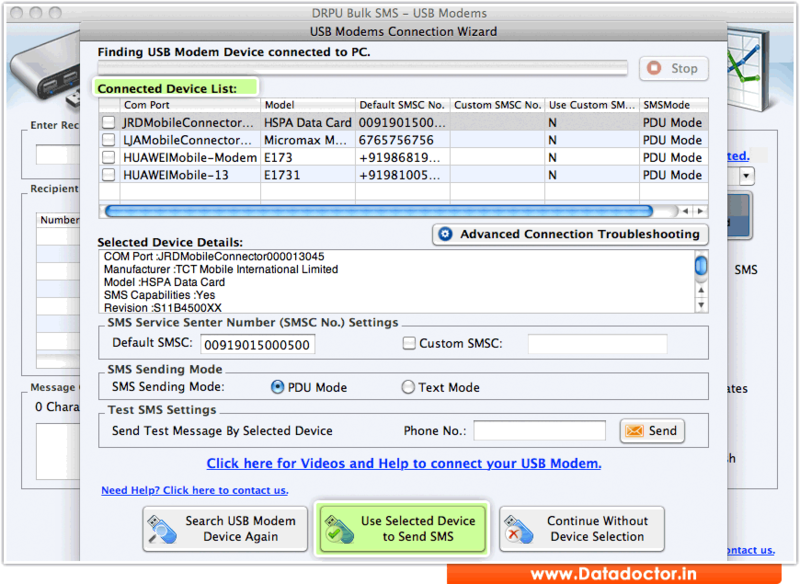 » SMS broadcasting software for Mac OS X supports all major brands of USB modem. » Group SMS software provides delayed delivery feature to control and manage bulk messaging process.